Blessing reportedly died in the accident. 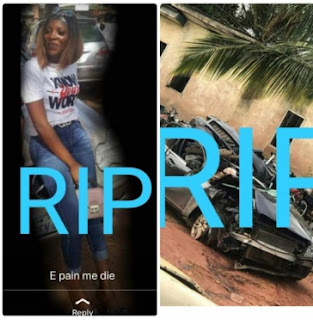 A female student of Ambrose Ali University identified simply as Blessing has died in a fatal accident yesterday, but her boyfriend survived. According to reports, the sad incident happened in Ekpoma, Edo State. It was further gathered that another occupant of the car who survived the accident, was also hospitalized. Before her untimely death, Blessing was a 100level student of Banking and Finance at Ambrose Ali University, Ekpoma, Edo State.